The R15-million Paul Roux Bethlehem Bulk Water Supply Scheme launched today by Premier Ace Magashule and his cabinet will see 9 200 families having access to clean drinking water for the first time in their lives. Residents of the town had to depend on boreholes for water supply and due to the lack of running water were forced to use the bucket toilet system instead of portable toilets. 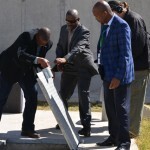 However, their fortunes changed yesterday when Magashule accompanied by social development MEC, Sisi Ntombela, cooperative governance, human settlement and traditional affairs MEC, Olly Mlamleli, descended on the small town to launch the bulk water project. Government has now installed a 45 kilometre water pipeline from Bethlehem to Paul Roux to ensure that there is water on the doorsteps of all the residents of the area. The project was rolled out in two phases. Construction of the pipeline started in 2010 and is expected to be completed in June this year. Speaking at the official launch ceremony, Ntombela said residents of Paul Roux will have access to water for the first time in hundred years. She said it was commendable that the provincial government had managed to deliver water to the community within the first 20 years of its rule. “Now that is a very good story to tell, and I had been talking to local women who have expressed their gratitude at this endeavour because when there are problems with water under any circumstances it is the women that stand to suffer,” said Ntombela. Mlamleli said the lack of running water had denied residents of the area the opportunity to do basic necessities such as cooking, watering their gardens and plants, washing and bathing. “Because of this development we are now going to build houses with running water taps inside, flushing toilets and bathrooms,” said Mlamleli. Dihlabeng Local Municipality technical director, Afrika Masuku, said 41 local residents were employed during the construction phase of the project. The executive mayor of Dihlabeng Local Municipality, Chetane Mofokeng, praised the joint efforts of the provincial government and the national department of water affairs to bring water to Paul Roux. 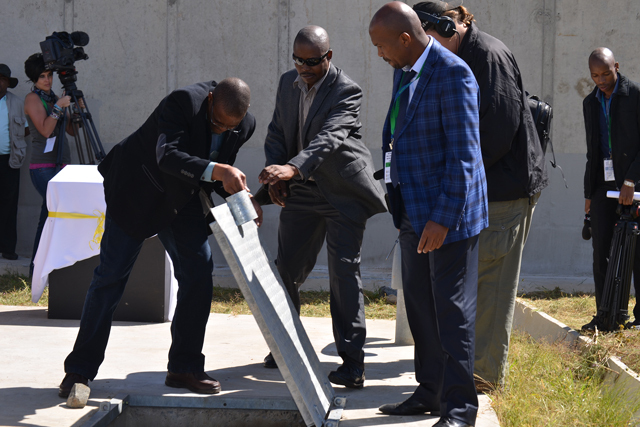 “It is a great milestone given that the people here did not have water for a century, we really appreciate this intervention as the municipality to deliver basic services and sanitation to our people,” said Mofokeng. Government has also built a new waste water treatment in the area which will process sewerage from neighbouring townships and cleanse it for recycling purposes. Project manager, Willie Lyons, said more people will be employed during the construction of a fence to protect the pipeline and the waste water treatment site and the future management of both facilities.